Doubt is a painful path to follow, even more so when it comes to religious belief. Shanley’s parable of doubt, first seen in 2005 and in Britain two years later, then carried under-currents in the US to do with George Bush’s second tenure of office. How much more so now would it resonate in the USA with today’s crusaders of certainty? In Britain in 2017, certainty and doubt are again at political loggerheads, as they are in the febrile atmosphere around gender and transgender identity issues. 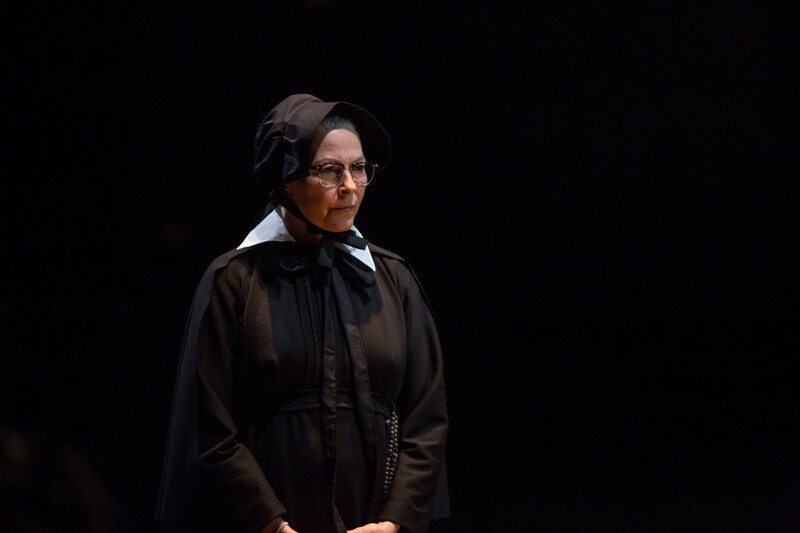 Shanley’s parable takes us back to circa 1964, a year after Kennedy’s assassination, to a fictional Catholic school ruled over by the austere Sister Aloysius – a woman, like the puritan zealots in Arthur Miller’s The Crucible, with all too keen a nose for wrong-doing and virtue infringed. She’ll do anything to protect her charges. And here’s the interesting bit. Shanley throws in the possibility of inappropriate behaviour arising from the parish priest, Father Flynn, who maintains that out of `kindness’, he has taken under his wing a certain Donald Muller (unseen), the only African-American boy in the school who may also, his mother later suggests, be gay. To the battle between kindness versus strict orthodoxy, Shanley also adds collusion – from the nervous Sister James, intimidated into revealing tell-tale signs (`a certain look’, alcohol on his breath, as Donald exits the refectory after meeting Father Flynn), to Donald’s mother who alerted to the possible implications of her son’s friendship, finds a different set of priorities to cling to: keeping Donald at the school until he can progress to High School, College and ultimately a better future. 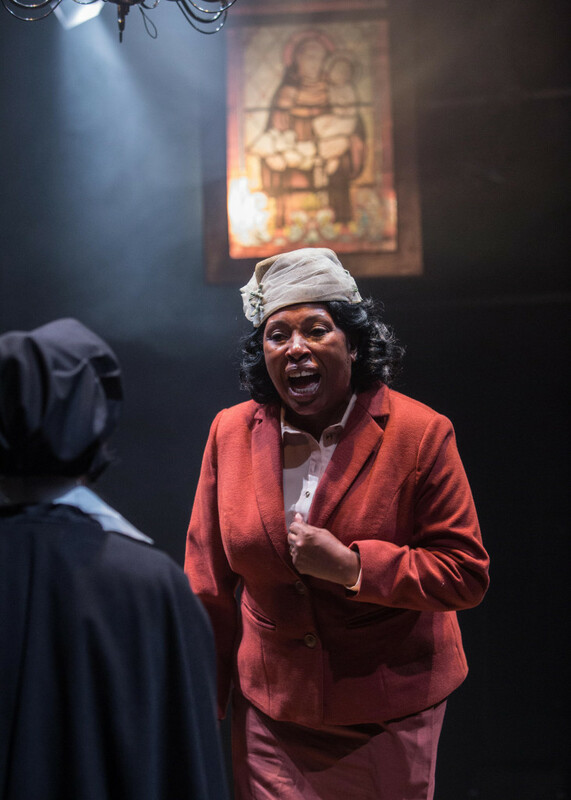 Ché Walker’s production in the Southwark Playhouse’s larger space certainly gives us the rudiments of these arguments on a traverse/in-the-round staging that tends to over-amplify rather than tease out the nuances. 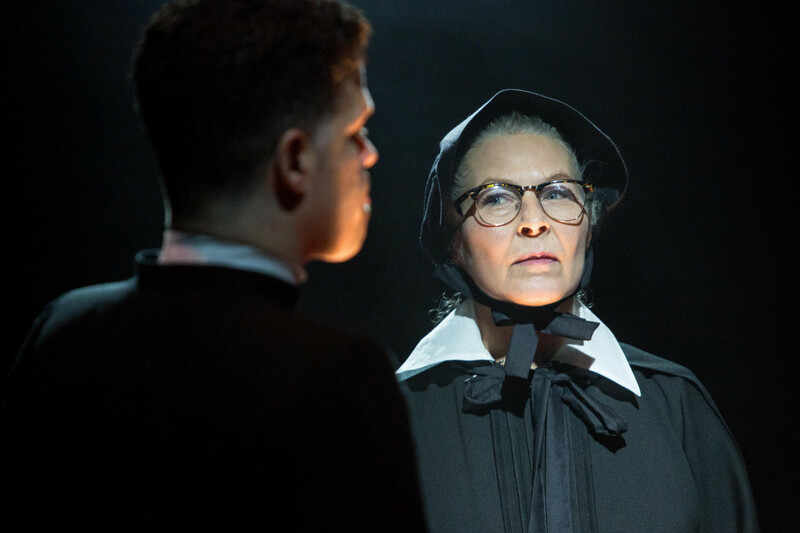 As Sister Aloysius, Stella Gonet in rigid black bonnet and round spectacles is a cracking agent of furious rectitude and piety as if trying to slay her own inner dragons of doubt. Jonathan Chambers as Father Flynn perhaps veers too much towards the bluff. 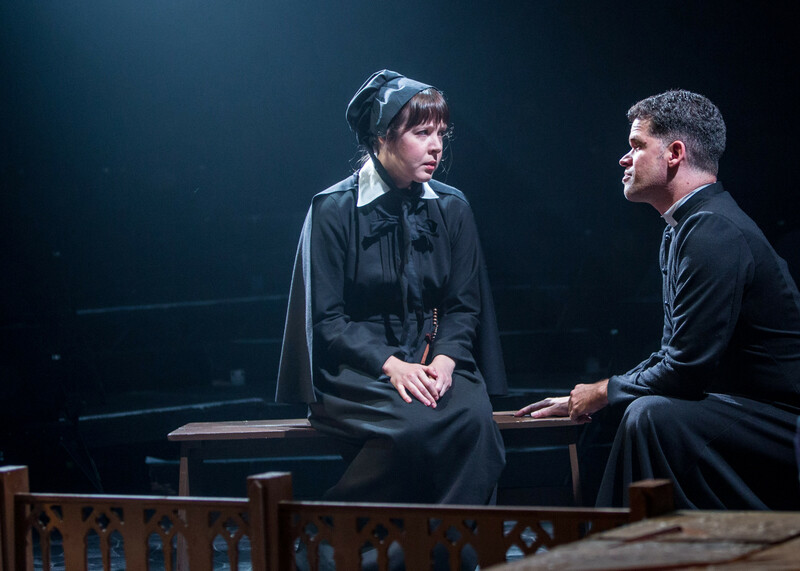 One of the strengths of Doubt in its original Tricycle production was to feel a constant niggling discomfort as to Father Flynn’s true intentions – a quality of opaqueness. Could he be guilty of the demons Sister Aloysius sees in him? That niggle is less visceral here. Still there are some fine set pieces, not least from Jo Martin as Mrs Muller, the mother with eyes beyond a small misdemeanour which she prefers to see as befriending a small boy in need of comfort (the father has apparently beaten him because of his `inclinations’). 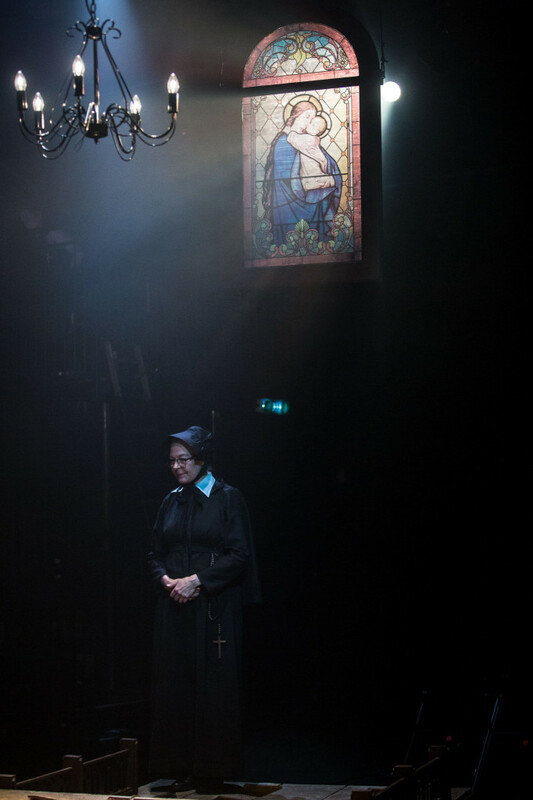 And a luminous Sister James from Clare Latham as the vulnerable, tentative but well meaning novice teacher. Evil actions come in many guises and as much as they can be overt, Shanley suggests, they can come through good intentions. Or malevolent, over-zealous certainty. This production at the Southwark Playhouse, one of my favourite smaller London theatres because of its intimate surround, presents the case but doesn’t quite muddy the waters sufficiently for us to feel as discomforted as we should by its opposing forces. Still, don’t take my word for it. Go and judge for yourselves. It raises vital issues. This entry was posted in 2017, Reviews and tagged Che Walker, Clare Latham, doubt versus certainty, Jo Martin, John Patrick Shanley, Jonathan Chambers, paedoliphilic murmurings, religious drama used as parable, Southwark Playhouse, Stella Gonet on September 13, 2017 by Carole Woddis.